Exhibition: Terre natale : ici, là-bas, quelque part ? The question of the home country and homeland, the place where one feels at home, has always been universal. It is even more topical for those people who are fleeing war zones, whose epicenter is the Middle-East, leaving their homes behind and hoping to find a new one in the host countries. “Terre natale : ici, là-bas, quelque part ?” (Homeland: here, there, somewhere?) is an exhibition organized by four MBA students in Contemporary Art at the Institute for Advanced Studies in Art (IESA) in Paris, in partnership with SYRIA.ART association. The exhibition brings together refugee and exiled artists around the theme of the homeland by allowing them to share their experience. Professional or non-professional artists, coming from different horizons, they testify through their works of their personal life trajectories and the destinies of their countries stuck in persistent turmoil. 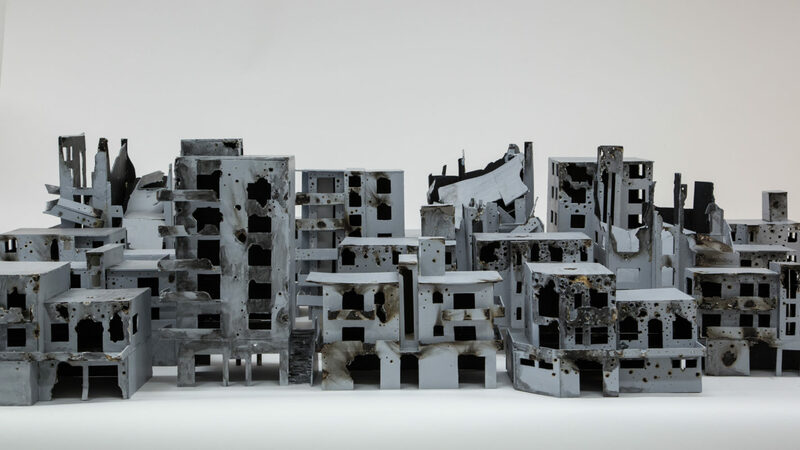 Among the works to be seen there are photographs of Nizar Ali Badr’s ephemeral sculptures, Souleymane Baldé’s embroidered canvases, Ali Darwish’s and Samer Tarabichi’s paintings and drawings, as well as Amir Elnour Adam’s documentary photographs.